I’ve been seeing this ad for Rozerem on TV lately. The idea is, the guy has wicked insomnia, and the characters from his dreams miss him, so they appear at his kitchen table in the middle of the night to tell him about the prescription sleep aid. What’s odd is that there’s only two dream characters—and they’re Abraham Lincoln and a beaver. No wonder this guy can’t sleep. He’s probably like the Twilight Zone guy who’s terrified of his dreams and is trying to stay awake forever. (Actually there’s a third, silent dream character who sidles up to the kitchen counter, but it’s unclear who he or she is. It looks like either an astronaut or a fish.) 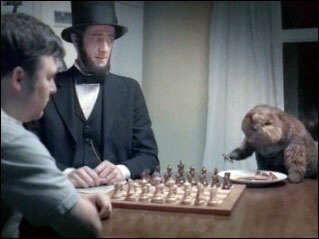 Humorously, the Web site is also built around Lincoln and the beaver. Lincoln even strikes a gangsta pose at one point. UPDATE: OK, so we’re a few weeks late on this one.